The Chumash were a North American maritime culture, originally based on the mainland and Channel Islands on both sides of the Santa Barbara Channel in California. (I use the past tense in describing the culture as maritime for, while many Chumash people still remain in the area, their culture is no longer defined by maritime activities.) The area is particularly rich in marine resources, and the Chumash used at least three kinds of boats to exploit them. Probably the first to appear was the tule reed "balsa," a raft of bundled reeds. It seems likely that tule balsas provided the means by which the islands were settled some 12,000 years ago, long before Chumash culture arose. Bundle boats are among the simplest of all watercraft to produce, and the main building materials were readily available in large quantities on the mainland shores of the Santa Barbara Channel, and in smaller amounts on the islands. In addition to large beds of reeds, naturally-occurring tar, in the form of asphaltum, is found in the area, and the Chumash used this to coat the reed bundles and increase their water resistance. Even with a tar coating, tule reeds are a short-lived commodity, so hard evidence for the use of such craft so long ago is hard to come by. 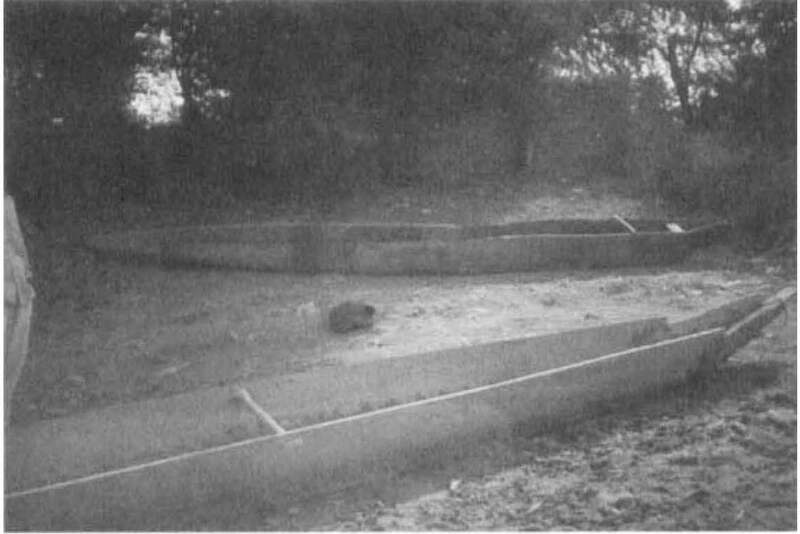 But the early occupation of the islands, and evidence of cross-channel trade that followed it but predates the probable development of other boat types, indicate that some sort of watercraft was in regular use, as do excavations of dwelling sites that indicate that the Chumash diet included marine animals that would have been difficult to obtain without the use of a boat. Tule reed balsas were still in use at the beginning of the historic era (around the middle of the 16th century AD), when the Spanish first explored and later colonized the area. They were about 2.5 meters LOA and capable of carrying two or three people. They were used primarily for nearshore and coastal fishing and transport, and occasionally for cross-channel crossings. 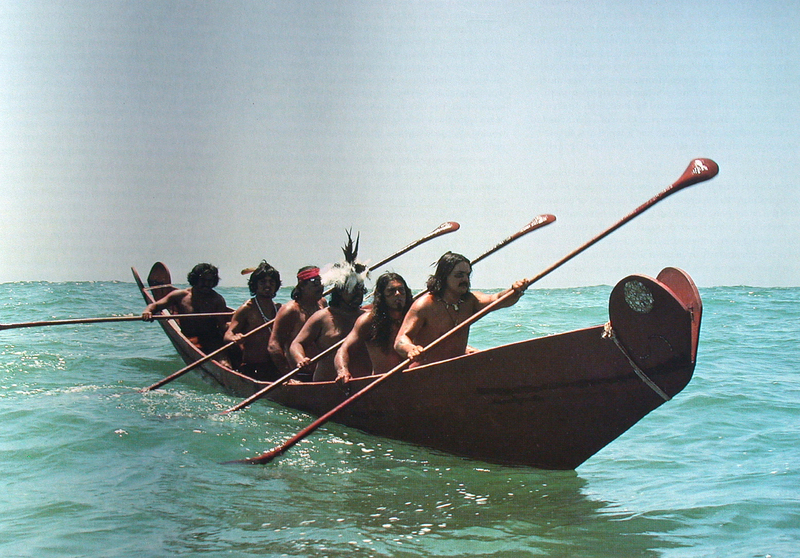 The Chumash also had dugout canoes, but confined them to nearshore and coastal use. The boat for which the Chumash are best known was a large and highly capable sewn-plank canoe called a tomol. The tomol has been called "the single most important, valuable property in the Chumash economy" and "one of the most sophisticated technological innovations in precolonial North America," and described as "(possibly) the most sophisticated and laborious-to-build large watercraft of the New World," requiring costly materials and some 500 man-days of skilled labor to construct (All three quotations: Arnold, 2007). As an unusually expensive construction, it is not surprising that the tomol played a central role in Chumash culture. Its development around 500 AD gave rise to the culture's central economic activities (fishing for large, powerful fish species, and trade), and defined important aspects of cultural hierarchy, including the creation of economic elites and the centralization of power in chiefdoms. Lines for the replica tomol shown above, based on a boat built in 1912 by an old Chumash master builder. The replica boat was 26.5 feet LOA. Tomols ranged from 3.7 to 9 meters LOA, with most between 6 and 7 meters. They were double-ended, with flat bottoms and lightly-curved sides that sloped sharply outward. Those of the most common size could carry two tons of cargo or 12 passengers, although far more passengers could be carried in a pinch. During the Chumash revolt in 1824, two tomols carried 50 adults and children, including crew, cross-channel from Mission Santa Barbara to escape from Spanish forces. Crews ranged from three to six men including a man assigned to bailing, for the tomol leaked constantly. Paddlers knelt on grass mats in the bottom, using double-bladed paddles with very long shafts and small, gourd-shaped blades. Tomols were launched from open beaches. They were light, and were launched by being lifted and placed in water deep enough to float them before they were loaded. One man remained in the water to help hold the boat bow-on to waves and give the boat a good shove to get it started. 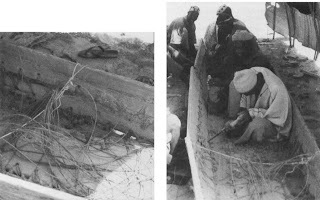 All common fishing methods were conducted from the tomol: hook and line (using hooks made of shell), netting, trapping, harpooning, and collecting by hand. Large, aggressive species, including swordfish, marlin, tuna, shark and giant sea bass were caught, as were anchovy, abalone, and sea mammals. The tomol made possible regular cross-channel trade in large, heavy, bulky items and nonessentials. Mainland exports to the islands included stone mortars and vessels, stone tool cores, bundles of milkweed fiber (used for binding, including stitching the tomol's planks), seeds, acorns, deer, bows and arrows, and large chunks of asphaltum. Reverse trade consisted mainly of finished products of stone or bone, baskets, and otter pelts. Considerable non-trade travel also occurred, probably for social, matrimonial and ceremonial purposes, the last of which might include the movement of an entire village. Fares were sometimes paid with shell bead money. Tomol construction was controlled by a guild and supervised by a master builder, known as the altomolich, who directed a building crew of six in a range of skilled tasks, including getting out and fitting planks, fastening, caulking, and decorating. In control of such a critical economic activity, the altomolich was of high status and well compensated. Only chiefs and altomolichs could afford to own tomols, and sometimes the two roles were held by a single individual. Stay tuned. We'll continue to look at the tomol in future posts. UPDATE, 2 May, 2014: Reader Yoram Meroz has pointed out his recent paper on the indigenous Chumash source of tomol technology. It convincingly refutes the theory that the tomol was introduced from Polynesia. Living in the semiarid Sahel region south of the Sahara Desert, the Songhai people of Mali have limited access to native timber for boatbuilding. But with the Niger River running through their land, boats are an economic necessity. The solution was this narrow canoe built of small pieces of palm wood sewn or stitched together with cord made from palm fiber. Boats like this were used from Lake Debo, near Timbuktu, to Ansongo, near Niger. A Songhai boat being built or repaired. 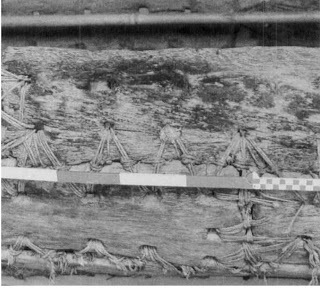 Typical lengths were between 6 and 7.5 meters; beams about 3/4 meter, and depth less than 50 cm. The traditional wood was from the dourmier or dum-palm, but other woods have been pressed into use more recently as they became available. Holes were through-bored near all plank edges. Seams and stitch holes were sealed with bourgou grass caulking. One thwart near the stern provided a seat for the boatman, and in some cases one to three additional seats were added. These would also have contributed to the boat's strength. The center thwart/brace in the foreground boat appears to pass through the sides of the hull. In the background boat, the rear cross-brace is clearly lashed to the top of the gunwale, while the seat-thwart appears to be below it, as in the plans at top. The boats were used for fishing and general transport, but around the city of Gao their primary use was the transportation of rice from the paddies to the villages for threshing. Propulsion was by both paddle and pole, depending upon the river's depth. Stitching detail, with grass caulking captured between the stitches. Around Gao, rice is harvested in December and January. Consequently, the boats generally underwent maintenance during October and November. This involved tightening or restitching and recaulking the seams. West of Lake Debo and south of Ansongo, a different kind of sewn boat was used. Called the Kole-Kole, this boat was two half-dugouts, sewn together along a central seam. This boat was preferred in its indigenous regions due to the presence of suitable trees for this type of construction. 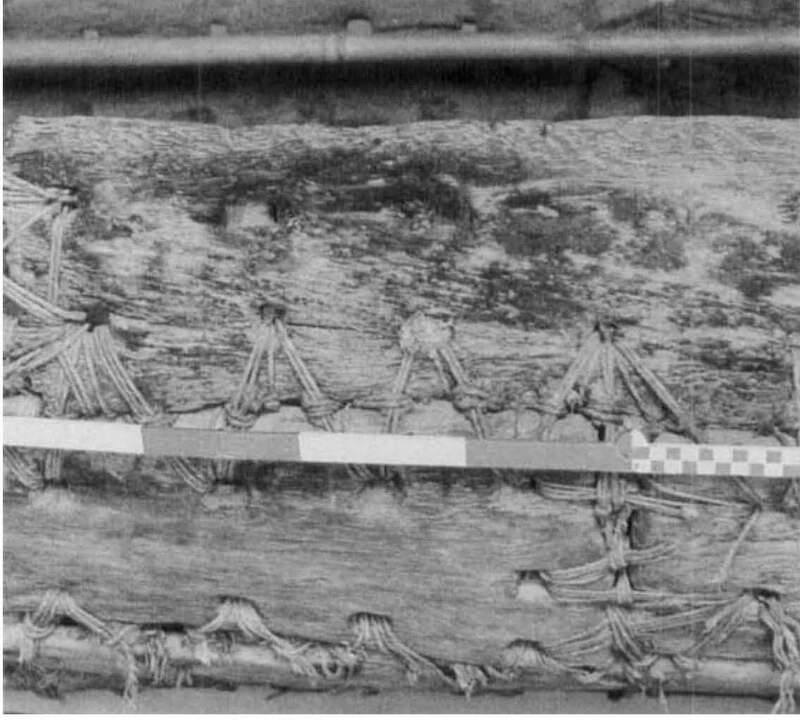 All information and images are from "A note on a sewn canoe in use at Gao, the Republic of Mali," by Timothy Insoll, in The International Journal of Nautical Archaeology (1993) 22.4: 345-350. This information is now two decades old, and I do not know if these boats are still in use.